Desert Castles of Ancient Khorezm is part of the Tentative list of Uzbekistan in order to qualify for inclusion in the World Heritage List. I visited this tentative WHS as a day trip from Khiva. I wanted to see the remains of these castles/fortresses in the Kyzyl Kum desert, Karakalpakstan to try to appreciate further the importance of the ancient Khorezm empire. Not much is left, but much more than the fortresses of Turkmenistan's inscribed Ancient Merv and Nissa combined! I visited the remains of the fortresses in Ayaz Kala and the ancient settlement of Toprak Kala (top left photo). The latter is quite similar to the remains in Nissa, Turkmenistan in a way with more desolate surroundings than the mountain scenery near Ashgabat. To explore the fortresses in Ayaz Kala well, a great deal of climbing is involved either on sand dunes, on dry mud mounds or on more dangerous rocky hills. Bring sturdy shoes and plenty of water here. The panoramic views from the different fortresses are similar to the US national parks on the west coast, mostly Monument Valley (top right photo). 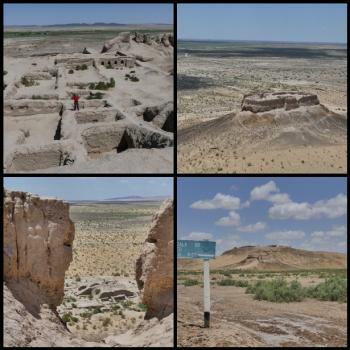 The Ayaz Kala desert castles (bottom right photo) are interesting as unlike other castles of ancient Khorezm, there are unfortified rural settlements and residential buildings, each enclosed by a low brick wall. These indicate that the process of separation of individual households from a tribal community had already begun at that time (I-VI century AD). Among dozens of unfortified farmhouses in the Ayaz-Kala complex, three fortresses-buildings stand out for their significant size. These are Ayaz 3, a giant fortress with a large courtyard surrounded by strong walls with towers and a maze near the gate (bottom left photo with the maze below the brick wall ruins). I don't know if these sites will ever get inscribed but I really enjoyed my visit to these off-the-beaten-track sites and I'd recommend them if you have a day to spare near Khiva.